The Quran is composed of verses (Ayat) that make up 114 chapters (suras) of unequal length which are classified either as Meccan(المكية) or Medinan (المدينية) depending upon the place and time of their claimed revelation. Muslims believe the Quran to be verbally revealed through angel Jibrīl (Gabriel) from God to Muhammad gradually over a period of approximately 23 years beginning on 22 December 609 CE, when Muhammad was 40, and concluding in 632 CE, the year of his death. Shortly after Muhammad’s death the Quran was compiled into a single book by order of the first Caliph Abu Bakr and at the suggestion of his future successor Umar. Hafsa, Muhammad’s widow and Caliph Umar’s daughter, was entrusted with that Quranic text after the second Caliph Umar died. When the third Caliph Uthman began noticing slight differences in pronunciation of the Quranic Arabic by those whose dialect was not that of the Quraish, he sought Hafsa’s permission to use her text and commissioned a committee to produce a standard copy of the text of Quran to which added diacritical marks ensured correct pronunciation, and to be set as the standard dialect, the Quraish dialect, now known as Fus’ha (Modern Standard Arabic) (see Origin and development of the Quran). Five of these original Qurans (Mus’haf) were sent to the major Muslim cities of the era, with Uthman keeping one for his own use in Medina. Any variations to standardized text were invalidated and ordered to be destroyed, all other versions of the Quran copied by scribes subsequently were from this codex. This process of formalization is known as the “Uthmanic recension“. The present form of the Quran text is accepted by most scholars as the original version compiled by Abu Bakr. 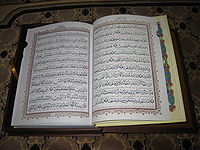 Muslims regard the Quran as the main miracle of Muhammad, the proof of his prophethood and the culmination of a series of divine messages that started with the messages revealed to Adam, regarded in Islam as the first prophet, and continued with the Suhuf Ibrahim (Scrolls of Abraham), the Tawrat (Torah or Pentateuch) of Moses, the Zabur (Tehillim or Book of Psalms) ofDavid, and the Injil (Gospel) of Jesus. The Quran assumes familiarity with major narratives recounted in Jewish and Christian scriptures, summarizing some, dwelling at length on others and in some cases presenting alternative accounts and interpretations of events. The Quran describes itself as a book of guidance, sometimes offering detailed accounts of specific historical events, and often emphasizing the moral significance of an event over its narrative sequence. The word qurʾān appears about 70 times in the Quran itself, assuming various meanings. It is a verbal noun (maṣdar) of the Arabic verb qaraʾa (قرأ), meaning “he read” or “he recited.” The Syriac equivalent is qeryānā, which refers to “scripture reading” or “lesson”. While most Western scholars consider the word to be derived from the Syriac, the majority of Muslim authorities hold the origin of the word is qaraʾa itself. In any case, it had become an Arabic term by Muhammad’s lifetime. An important meaning of the word is the “act of reciting”, as reflected in an early Quranic passage: “It is for Us to collect it and to recite it (qurʾānahu)”. In other verses, the word refers to “an individual passage recited [by Muhammad]”. Its liturgical context is seen in a number of passages, for example: “So when al-qurʾān is recited, listen to it and keep silent”. The word may also assume the meaning of a codified scripture when mentioned with other scriptures such as the Torah and Gospel. The term also has closely related synonyms that are employed throughout the Quran. Each synonym possesses its own distinct meaning, but its use may converge with that ofqurʾān in certain contexts. Such terms include kitāb (“book”); āyah (“sign”); and sūrah (“scripture”). The latter two terms also denote units of revelation. In the large majority of contexts, usually with a definite article (al-), the word is referred to as the “revelation” (wahy), that which has been “sent down” (tanzīl) at intervals. Other related words are:dhikr, meaning “remembrance,” used to refer to the Quran in the sense of a reminder and warning; and ḥikma, meaning “wisdom”, sometimes referring to the revelation or part of it. The Quran has many other names. Among those found in the text itself are al-furqān (“discernment” or “criterion”), al-hudah (“the guide”), ḏikrallāh (“the remembrance of God”), al-ḥikmah (“the wisdom”), and kalāmallāh (“the word of God”). Another term is al-kitāb (“the book”), though it is also used in the Arabic language for other scriptures, such as the Torah and the Gospels. 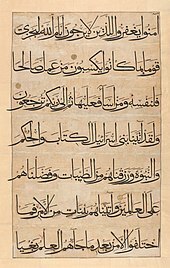 The term muṣḥaf (“written work”) is often used to refer to particular Quranic manuscripts but is also used in the Quran to identify earlier revealed books. 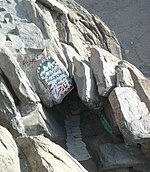 Cave of Hira, location of Muhammad’s first revelation. Islamic tradition relates that Muhammad received his first revelation in the Cave of Hira during one of his isolated retreats to the mountains. Thereafter, he received revelations over a period of twenty-three years. According to hadith and Muslim history, after Muhammad emigrated to Medinaand formed an independent Muslim community, he ordered a considerable number of the sahabah to recite the Quran and to learn and teach the laws, which were revealed daily. Companions who engaged in the recitation of the Quran were called Qari. Since most sahabah were unable to read or write, they were ordered to learn from the prisoners-of-war the simple writing of the time. Thus a group of sahabah gradually became literate. As it was initially spoken, the Quran was recorded on tablets, bones and the wide, flat ends of date palm fronds. Most chapters were in use amongst early Muslims since they are mentioned in numerous sayings by both Sunni and Shia sources, relating Muhammad’s use of the Quran as a call to Islam, the making of prayer and the manner of recitation. However, the Quran did not exist in book form at the time of Muhammad’s death in 632. Sahih Bukhari narrates Muhammad describing the revelations as, “Sometimes it is (revealed) like the ringing of a bell” andAisha reported, “I saw the Prophet being inspired Divinely on a very cold day and noticed the sweat dropping from his forehead (as the Inspiration was over)”. The Islamic studies scholar Welch states in the Encyclopaedia of Islam that he believes the graphic descriptions of Muhammad’s condition at these moments may be regarded as genuine, because he was severely disturbed after these revelations. According to Welch, these seizures would have been seen by those around him as convincing evidence for the superhuman origin of Muhammad’s inspirations. However, Muhammad’s critics accused him of being a possessed man, asoothsayer or a magician since his experiences were similar to those claimed by such figures well known in ancient Arabia. Welch additionally states that it remains uncertain whether these experiences occurred before or after Muhammad’s initial claim of prophethood. The Quran states that Muhammad was ummi, interpreted as illiterate in Muslim tradition. According to Watt, the meaning of the Quranic term ummi is unscriptured rather than illiterate. Quran manuscript from the 7th century CE, written on vellum in the Hijazi script. According to Shias, Sufis and scarce Sunni scholars, Ali compiled a complete version of the Quran mus’hafimmediately after Muhammad’s death. The order of this mus’haf differed from that gathered later during Uthman‘s era. Despite this, Ali made no objection or resistance against standardized mus’haf, but kept his own book. In about 650, as Islam expanded beyond the Arabian peninsula into Persia, the Levant and North Africa, the third caliph Uthman ibn Affanordered the preparation of an official, standardized version, to preserve the sanctity of the text (and perhaps to keep the Rashidun Empire united, which became known as the Uthman Quran). Five reciters from amongst the companions produced a unique text from the first volume, which had been prepared on the orders of Abu Bakr and was kept with Hafsa bint Umar. The other copies already in the hands of Muslims in other areas were collected and sent to Medina where, on orders of the Caliph, they were destroyed by burning or boiling. This remains the authoritative text of the Quran to this day. The Quran in its present form is generally considered by academic scholars to record the words spoken by Muhammad because the search for variants in Western academia has not yielded any differences of great significance. Although most variant readings of the text of the Quran have ceased to be transmitted, some still are. There has been no critical text produced on which a scholarly reconstruction of the Quranic text could be based. Historically, controversy over the Quran’s content has rarely become an issue, although debates continue on the subject. 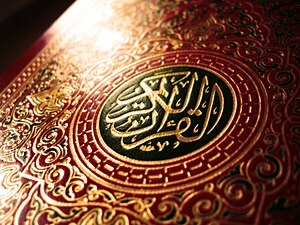 Muslims believe the Quran to be the book of divine guidance and direction for humanity and consider the text in its original Arabic to be the literal word of God, revealed to Muhammad through the angel Gabriel over a period of twenty-three years and view the Quran as God’s final revelation to humanity. Wahy in Islamic and Quranic concept means the act of God addressing an individual, conveying a message for a greater number of recipients. The process by which the divine message comes to the heart of a messenger of God is tanzil (to send down) or nuzul (to come down). As the Quran says, “With the truth we (God) have sent it down and with the truth it has come down.” It designates positive religion, the letter of the revelation dictated by the angel to the prophet. It means to cause this revelation to descend from the higher world. According to hadith, the verses were sent down in special circumstances known as asbab al-nuzul. However, in this view God himself is never the subject of coming down. The Quran frequently asserts in its text that it is divinely ordained, an assertion that Muslims believe. The Quran – often referring to its own textual nature and reflecting constantly on its assertion of divine origin – is the most meta-textual, self-referential religious text. The Quran refers to a written pre-text that records God’s speech even before it was sent down. The issue of whether the Quran is eternal or created was one of the crucial controversies among early Muslim theologians. Mu’tazilis believe it is created while the most widespread varieties of Muslim theologians consider the Quran to be eternal and uncreated. Sufi philosophers view the question as artificial or wrongly framed. Muslims maintain the present wording of the Quranic text corresponds exactly to that revealed to Muhammad himself: as the words of God, said to be delivered to Muhammad through the angel Gabriel. Muslims consider the Quran to be a guide, a sign of the prophethood of Muhammad and the truth of the religion. They argue it is not possible for a human to produce a book like the Quran, as the Quran itself maintains. The Basic Law of Saudi Arabia declares the Quran and sunnah the sole constitutional law of the kingdom. Muslims believe that the Quran is different from all other books in ways that are impossible for any other book to be, such that similar texts cannot be written by humans. These include both mundane and miraculous claims. The Quran itself challenges any who disagree with its divine origin to produce a text of a miraculous nature. The text of the Quran consists of 114 chapters of varying lengths, each known as a sura. Chapters are classed as Meccan or Medinan, depending on when (before or after Hijra) the verses were revealed. Chapter titles are derived from a name or quality discussed in the text, or from the first letters or words of the sura. Muslims believe that Muhammad, on God’s command, gave the chapters their names. Generally, longer chapters appear earlier in the Quran, while the shorter ones appear later. The chapter arrangement is thus not connected to the sequence of revelation. Each sura except the ninth starts with the Bismillah, an Arabic phrase meaning (“In the name of God, Most Gracious, Most Merciful”). There are, however, still 114 occurrences of the bismillah in the Quran, due to its presence in verse 27:30 as the opening of Solomon’s letter to the Queen of Sheba. Each sura is formed from several ayat (verses), which originally means a sign or portent sent by God. The number of verses differ from chapter to chapter. An individual verse may be just a few letters or several lines. The verses are unlike the highly refined poetry of thepre-Islamic Arabs in their content and distinctive rhymes and rhythms, being more akin to the prophetic utterances marked by inspired discontinuities found in the sacred scriptures of Judaism and Christianity. The actual number of ayat has been a controversial issue among Muslim scholars since Islam’s inception, some recognizing 6,000, some 6,204, some 6,219, and some 6,236, although the words in all cases are the same. The most popular edition of the Quran, which is based on the Kufa school tradition, contains 6,236ayat. There is a crosscutting division into 30 parts of roughly equal division, ajza, each containing two units called ahzab, each of which is divided into four parts (rub ‘al-ahzab). The Quran is also divided into seven approximately equal parts, manazil, for it to be recited in a week. The Quranic text seems to have no beginning, middle, or end, its nonlinear structure being akin to a web or net. The textual arrangement is sometimes considered to have lack of continuity, absence of any chronological or thematic order, and presence of repetition. Fourteen different Arabic letters form 14 different sets of “Quranic Initials” (the “Muqatta’at“, such as A.L.M. of 2:1) and prefix 29 suras in the Quran. The meaning and interpretation of these initials is considered unknown to most Muslims. The Quranic verses contain general exhortations regarding right and wrong and the nature of revelation. Historical events are related to outline general moral lessons. Verses pertaining to natural phenomena have been interpreted by Muslims as an indication of the authenticity of the Quranic message. The Quran’s message is conveyed with various literary structures and devices. In the original Arabic, the chapters and verses employphonetic and thematic structures that assist the audience’s efforts to recall the message of the text. Muslims[who?] assert (according to the Quran itself) that the Quranic content and style is inimitable. Michael Sells, citing the work of the critic Norman O. Brown, acknowledges Brown’s observation that the seeming “disorganization” of Quranic literary expression – its “scattered or fragmented mode of composition,” in Sells’s phrase – is in fact a literary device capable of delivering “profound effects – as if the intensity of the prophetic message were shattering the vehicle of human language in which it was being communicated.” Sells also addresses the much-discussed “repetitiveness” of the Quran, seeing this, too, as a literary device. Tafsir is one of the earliest academic activities of Muslims. According to the Quran, Muhammad was the first person who described the meanings of verses for early Muslims.Other early exegetes included a few Companions of Muhammad, like Ali ibn Abi Talib, Abdullah ibn Abbas, Abdullah ibn Umar and Ubayy ibn Kab. Exegesis in those days was confined to the explanation of literary aspects of the verse, the background of its revelation and, occasionally, interpretation of one verse with the help of the other. If the verse was about a historical event, then sometimes a few traditions (hadith) of Muhammad were narrated to make its meaning clear. 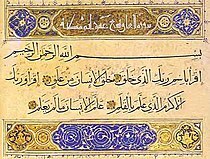 Because the Quran is spoken in classical Arabic, many of the later converts to Islam (mostly non-Arabs) did not always understand the Quranic Arabic, they did not catch allusions that were clear to early Muslims fluent in Arabic and they were concerned with reconciling apparent conflict of themes in the Quran. Commentators erudite in Arabic explained the allusions, and perhaps most importantly, explained which Quranic verses had been revealed early in Muhammad’s prophetic career, as being appropriate to the very earliest Muslim community, and which had been revealed later, canceling out or “abrogating” (nasikh) the earlier text (mansukh). Other scholars, however, maintain that no abrogation has taken place in the Qur’an. Ja’far Kashfi defines ta’wil as ‘to lead back or to bring something back to its origin or archetype’. It is a science whose pivot is a spiritual direction and a divine inspiration, while thetafsir is the literal exegesis of the letter; its pivot is the canonical Islamic sciences. Muhammad Husayn Tabatabaei says that according to the popular explanation among the later exegetes, ta’wil indicates the particular meaning a verse is directed towards. The meaning of revelation (tanzil), as opposed to ta’wil, is clear in its accordance to the obvious meaning of the words as they were revealed. But this explanation has become so widespread that, at present, it has become the primary meaning of ta’wil, which originally meant “to return” or “the returning place”. In Tabatabaei’s view, what has been rightly called ta’wil, or hermeneutic interpretation of the Quran, is not concerned simply with the denotation of words. Rather, it is concerned with certain truths and realities that transcend the comprehension of the common run of men; yet it is from these truths and realities that the principles of doctrine and the practical injunctions of the Quran issue forth. Interpretation is not the meaning of the verse; rather it transpires through that meaning – a special sort of transpiration. There is a spiritual reality, which is the main objective of ordaining a law, or the basic aim in describing a divine attribute—and there is an actual significance a Quranic story refers to. According to Tabatabaei, there are acceptable and unacceptable esoteric interpretations. Acceptable ta’wil refers to the meaning of a verse beyond its literal meaning; rather the implicit meaning, which ultimately is known only to God and can’t be comprehended directly through human thought alone. The verses in question here refer to the human qualities of coming, going, sitting, satisfaction, anger, and sorrow, which are apparently attributed to God. Unacceptable ta’wil is where one “transfers” the apparent meaning of a verse to a different meaning by means of a proof; this method is not without obvious inconsistencies. Although this unacceptable ta’wil has gained considerable acceptance, it is incorrect and cannot be applied to the Quranic verses. The correct interpretation is that reality a verse refers to. It is found in all verses, the decisive and the ambiguous alike; it is not a sort of a meaning of the word; it is a fact that is too sublime for words. God has dressed them with words to bring them a bit nearer to our minds; in this respect they are like proverbs that are used to create a picture in the mind, and thus help the hearer to clearly grasp the intended idea. Therefore Sufi spiritual interpretations are usually accepted by Islamic scholars as authentic, as long as certain conditions are met. In Sufi history, these interpretations were sometimes considered religious innovations (bid’ah), as Salafis believe today. However, ta’wil is extremely controversial even amongst Shia. For example, when Ayatollah Ruhallah Khomeini, the leader of Islamic revolution, gave some lectures about Sura al-Fatiha in December 1979 and January 1980, protests forced him to suspend them before he could continue beyond the first two verses of the surah. Commentaries dealing with the zahir (outward aspects) of the text are called tafsir, and hermeneutic and esoteric commentaries dealing with the batin are called ta’wil(“interpretation” or “explanation”), which involves taking the text back to its beginning. Commentators with an esoteric slant believe that the ultimate meaning of the Quran is known only to God. In contrast, Quranic literalism, followed by Salafis and Zahiris, is the belief that the Quran should only be taken at its apparent meaning. The first Quran to be translated into a European vernacular language: L’Alcoran de Mahomet,André du Ryer, 1647. Nevertheless, the Quran has been translated into most African, Asian and European languages. The first translator of the Quran was Salman the Persian, who translated sura Al-Fatiha into Persian during the 7th century. The first complete translation of the Quran was completed in 884 CE in Alwar (Sindh, India now Pakistan) by the orders of Abdullah bin Umar bin Abdul Aziz on the request of the Hindu Raja Mehruk. The first complete translation of Quran was into Persian during the reign of Samanids in the 9th century. 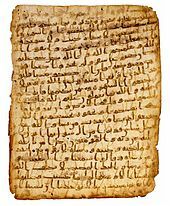 Islamic tradition holds that translations were made for Emperor Negus of Abyssinia and Byzantine Emperor Heraclius, as both received letters by Muhammad containing verses from the Quran. 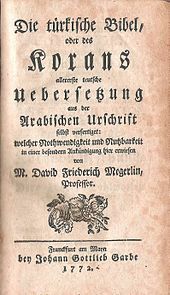 In early centuries, the permissibility of translations was not an issue, but whether one could use translations in prayer. Verses 33 and 34 of sura Ya-Seen in this Chinese translation of the Quran. Robert of Ketton‘s 1143 translation of the Quran for Peter the Venerable, Lex Mahumet pseudoprophete, was the first into a Western language (Latin). 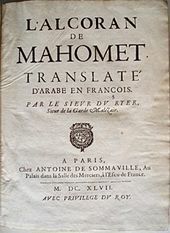 Alexander Ross offered the first English version in 1649, from the French translation of L’Alcoran de Mahomet (1647) by Andre du Ryer. In 1734, George Sale produced the first scholarly translation of the Quran into English; another was produced by Richard Bell in 1937, and yet another by Arthur John Arberry in 1955. All these translators were non-Muslims. There have been numerous translations by Muslims. The English translators have sometimes favored archaic English words and constructions over their more modern or conventional equivalents; for example, two widely read translators, A. Yusuf Ali and M. Marmaduke Pickthall, use the plural and singular “ye” and “thou” instead of the more common “you“. In addition to and largely independent of the division into suras, there are various ways of dividing the Quran into parts of approximately equal length for convenience in reading, recitation and memorization. The thirty ajza can be used to read through the entire Quran in a week or a month. Some of these parts are known by names and these names are the first few words by which the juz’ starts. A juz’ is sometimes further divided into two ahzab, and each hizb subdivided into four rub ‘al-ahzab. A different structure is provided by the ruku’at, semantical units resembling paragraphs and comprising roughly ten ayat each. Some also divide the Quran into sevenmanazil to facilitate complete recitation in a week. One meaning of Quran is “recitation”. Tajwid, an Arabic word for elocution, is a set of rules that governs how the Quran should be recited and is assessed in terms of how accessible the recitation is to those intent on concentrating on the words. To perform salat (prayer), a mandatory obligation in Islam, a Muslim is required to learn at least some sura of the Quran (typically starting with the first one, al-Fatiha, known as the “seven oft-repeated verses,” and then moving on to the shorter ones at the end). Until one has learned al-Fatiha, a Muslim can only say phrases like “praise be to God” during the salat. Quran with colour-coded tajwid rules. A person whose recital repertoire encompasses the whole Quran is called a qari’, whereas a memoriser of the Quran is called a hafiz (fem. Hafaz) (which translate as “reciter” or “protector,” respectively). 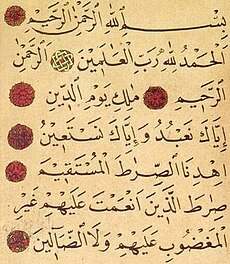 Muhammad is regarded as the first qari’ since he was the first to recite it. Recitation (tilawa تلاوة) of the Quran is a fine art in the Muslim world. These recitations differ in the vocalization (tashkil) of a few words, which in turn gives a complementary meaning to the word in question according to the rules of Arabic grammar. For example, the vocalization of a verb can change its active and passive voice. It can also change its stemformation, implying intensity for example. Vowels may be elongated or shortened, and glottal stops (hamzas) may be added or dropped, according to the respective rules of the particular recitation. For example, the name of archangel Gabriel is pronounced differently in different recitations: Jibrīl, Jabrīl, Jibra’īl, and Jibra’il. Abd al-Rahman Ibn Abd al-Qari narrated: “Umar Ibn Khattab said before me: I heard Hisham Ibn Hakim Ibn Hizam reading Surah Furqan in a different way from the one I used to read it, and the Prophet (sws) himself had read out this surah to me. Consequently, as soon as I heard him, I wanted to get hold of him. However, I gave him respite until he had finished the prayer. Then I got hold of his cloak and dragged him to the Prophet (sws). I said to him: “I have heard this person [Hisham Ibn Hakim Ibn Hizam] reading Surah Furqan in a different way from the one you had read it out to me.” The Prophet (sws) said: “Leave him alone [O ‘Umar].” Then he said to Hisham: “Read [it].” [Umar said:] “He read it out in the same way as he had done before me.” [At this,] the Prophet (sws) said: “It was revealed thus.” Then the Prophet (sws) asked me to read it out. So I read it out. [At this], he said: “It was revealed thus; this Quran has been revealed in Seven Ahruf. You can read it in any of them you find easy from among them. Abu Abd al-Rahman al-Sulami reports, “the reading of Abu Bakr, Umar, Uthman and Zayd ibn Thabit and that of all the Muhajirun and the Ansar was the same. They read the Quran according to the Qira’at al-‘ammah. This is the same reading the Prophet (sws) read twice to Gabriel in the year of his death. Zayd ibn Thabit was also present in this reading [called] the ‘Ardah-i akhirah. It was this very reading that he taught the Quran to people till his death”. Ibn Sirin writes, “the reading on which the Quran was read out to the prophet in the year of his death is the same according to which people are reading the Quran today”. AZ [however] says that the people of El-Hijaz and Hudhayl, and the people of Makkah and Al-Madinah, to not pronounce hamzah [at all]: and ‘Isa Ibn-‘Omar says, Tamim pronounce hamzah, and the people of Al-Hijaz, in cases of necessity, [in poetry,] do so. 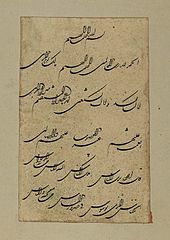 Page from a Quran (‘Umar-i Aqta’). Iran, Afghanistan, Timurid dynasty, circa 1400. Opaquewatercolor, ink and gold on paper Muqaqqaq script. 170 x 109cm (66 15/16 x 42 15/16in). Historical region: Uzbekistan. 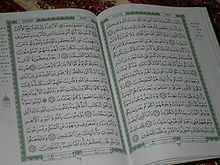 Most Muslims today use printed editions of the Quran. There are many editions, large and small, elaborate or plain, expensive or inexpensive. Bilingual forms with the Arabic on one side and a gloss into a more familiar language on the other are very popular. Qurans are produced in many different sizes. Most are of a reasonable book size, but there exist extremely large Qurans (usually for display purposes) and very small Qurans (sometimes given as gifts). An Illuminated Quran from the library of Tippoo Ṣāḥib was presented to the University of Cambridge by the Court of Directors of the East India Company in 1806. The volume has two decorated medallions and two magnificent headpieces containing Al-Fatiha. The text of the Quran is followed by some prayers, and a Fal-nāmah. The manuscript is not dated, but dates of ownership of 1028 A.H./1618 C.E. and 1066 A.H./1655 C.E. occur at the beginning. Before printing was widely adopted in the 19th century, the Quran was transmitted in manuscript books made by copyists and calligraphers. 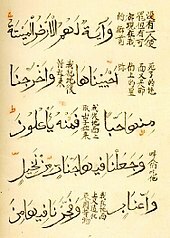 Short extracts from the Quran were printed in the medieval period from carved wooden blocks, one block per page; a technique already widely used in China. 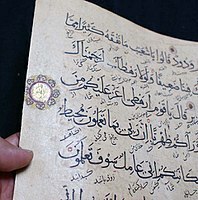 However there are no records of complete Qurans produced in this way, which would have involved a very large investment.Mass-produced less expensive versions of the Quran were produced from the 19th century by lithography, which allowed reproduction of the fine calligraphy of hand-made versions. The first and last chapters of the Quran together written in theShikastah style. 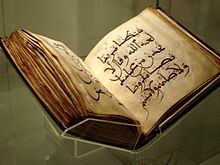 The oldest surviving Quran printed with movable type was produced in Venice in 1537/1538. It seems to have been prepared for sale in the Ottoman empire, where all movable type printing using Arabic characters had been forbidden in 1485. This decree was reversed in 1588, but there remained strong resistance to adopting movable type printing for any subjects, let alone the Quran, until the late 19th century. This seems to have been partly from opposition by the large profession of copyists, and for aesthetic reasons, and fear of mistakes in the text. Catherine the Great of Russia sponsored a printing of the Quran in 1787. This was followed by editions from Kazan (1828), Persia (1833) and Istanbul (1877). It is extremely difficult to render the full Quran, with all the points, in computer code, such as Unicode. The Internet Sacred Text Archive makes computer files of the Quran freely available both as images and in a temporary Unicode version. Various designers and software firms have attempted to develop computer fonts that can adequately render the Quran. Since Muslim tradition felt that directly portraying sacred figures and events might lead to idolatry, it was considered wrong to decorate the Quran with pictures (as was often done for Christian texts, for example). Muslims instead lavished love and care upon the sacred text itself. Arabic is written in many scripts, some of which are complex and beautiful. Arabic calligraphy is a highly honored art, much like Chinese calligraphy. Muslims also decorated their Qurans with abstract figures (arabesques), colored inks, and gold leaf. Pages from some of these antique Qurans are displayed throughout this article. The Quran speaks well of the relationship it has with former books (the Torah and the Gospel) and attributes their similarities to their unique origin and saying all of them have been revealed by the one God. According to Sahih Bukhari, the Quran was recited among Levantines and Iraqis, and discussed by Christians and Jews before it was standardized. Its language was similar to the Syriac language. The Quran recounts stories of many of the people and events recounted in Jewish and Christian sacred books (Tanakh, Bible) and devotional literature (Apocrypha, Midrash), although it differs in many details. Adam, Enoch, Noah, Eber, Shelah, Abraham, Lot,Ishmael, Isaac, Jacob, Joseph, Job, Jethro, David, Solomon, Elijah, Elisha, Jonah, Aaron, Moses, Zechariah, John the Baptist, and Jesus are mentioned in the Quran as prophets of God (see Prophets of Islam). In fact, Moses is mentioned more in the Quran than any other individual. Jesus is mentioned more often in the Quran than Muhammad while Mary is mentioned in the Quran more than the New Testament. Muslims believe the common elements or resemblances between the Bible and other Jewish and Christian writings and Islamic dispensations is due to their common divine source, and that the original Christian or Jewish texts were authentic divine revelations given to prophets. The Quran has been noted to have certain narratives similarities to the Diatessaron, Protoevangelium of James, Infancy Gospel of Thomas, Gospel of Pseudo-Matthew and theArabic Infancy Gospel. One scholar has suggested that the Diatessaron, as a gospel harmony, may have led to the conception that the Christian Gospel is one text. 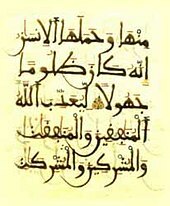 Although Arabic, as a language and a literary tradition, was quite well developed by the time of Muhammad’s prophetic activity, it was only after the emergence of Islam, with its founding scripture in Arabic, that the language reached its utmost capacity of expression, and the literature its highest point of complexity and sophistication. Indeed, it probably is no exaggeration to say that the Quran was one of the most conspicuous forces in the making of classical and post-classical Arabic literature. Respect for the written text of the Quran is an important element of religious faith by many Muslims. They believe that intentionally insulting the Quran is a form ofblasphemy. Many Muslims memorize at least some portion of the Quran in the original Arabic, usually at least the verses needed to perform the contact prayers (solat). Those who have memorized the entire Quran earn the right to the title of Hafiz. Arabic Quran with Persian translation. Arabic Quran with Persian translation from the Ilkhanid Era. Most Muslims treat paper copies of the Quran with reverence. Based on tradition and a literal interpretation of sura 56:77–79: “That this is indeed a Quran Most Honourable, In a Book well-guarded, Which none shall touch but those who are clean”, many scholars believe that a Muslim must perform a ritual cleansing with water (wudu) before touching a copy of the Quran, or mus’haf, although this view is not universal. Defiling or dismembering copies of the Quran is considered Quran desecration. Pulping, recycling, or otherwise discarding worn-out copies of the text is forbidden. Worn-out, torn, or errant (for example, pages out of order) Qurans are left free to flow in a river, kept somewhere safe, burned, or buried in a remote location.